Case Study: RPZ Valve Inside Gets Moved - Who Pays for This Change? In today’s fast paced way of life, owners now put more and more pressure on the architect, engineers, and contractors to design and build projects as quickly as possible. Everyone in this process is required to do things faster and in many cases, we find ourselves making the same decisions and doing the same things over and over to save precious time. This is especially true for RPZ backflow preventer placement. This design item often gets very little thought on a typical project. You keep on doing what you've always done and move on to the next item on the long list of things to do. Well, it's time to change this status quo. RPZ devices should not be installed indoors and this is an excellent example of why. 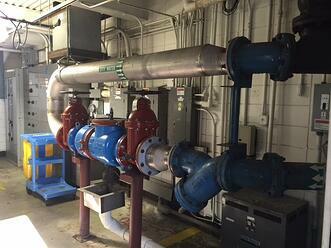 This case study takes a look at a bottling plant's decision to move the RPZ valve from inside the building to outside the building. Take a look at this picture. See what’s adjacent to the device? Transformers and electrical panels. This is the main reason why this RPZ device is being moved outside. An RPZ's job is to dump water during it's normal intended use. Click here for a refresher on the differences between RPZ and DCDA backflow preventers. Now imagine the device doing its job. We’ve met with over 1000 design engineers in the last year and they are astounded when they see what happens when the RPZ does its job. You can even see it in action on video. If the much larger device pictured fails, imagine the electrical problems the customer will face. Why Are RPZ Devices Installed Inside? This is a common practice, but it's one that just doesn't make much sense. The biggest reasons for installing these backflow preventers inside are aesthetic ones. RPZ backflow preventers cannot be installed below ground. That means they either go outside in an industrial enclosure, or inside. Most architects want as few eyesores on the property as possible, so they urge designers to place them inside. Many owners think they want the same. Is avoiding an "ugly box" a good reason to face possible disaster when this device does its job? Is it a good reason to waste valuable space in the building? We say absolutely not, and, if they were informed, most business owners would agree. However, aesthetics should not even be part of the equation. There are multiple easy ways to avoid an eyesore when installing a backflow device outside in an enclosure. Moving RPZ valves outside is just one of the big backflow installation trends. Read more here. Why is this device being moved outside? In this particular situation, the RPZ valve was installed inside right next to transformers, switch gear, and electrical panels. They would all be impacted in this device were to fail. This could disrupt the plant and potentially shut it down for several days. Most businesses cannot afford to be down for an extended period. The owner's livelihood is at risk here and typically architects and engineers aren't thinking about that when they choose to install these devices inside. They should. Because these things do happen, and they affect the designers as well. As you can see from this picture, an RPZ backflow preventer failed and flooded the room it was in, as well as the the one next to it when it blew the wall out. The room next to it housed telecom equipment. It was not a cheap and easy fix. When the insurance company investigated this disaster, they placed the blame on the designers. In this instance, the insurance company collected just over a million dollars from the designers. To avoid such an awful incident, this bottling plant is being proactive by moving it outside before something happens. They still end up having to pay for the same equipment twice - when it was first installed and when it's moved outside. The plant manager and facilities director will still have quite the headache when the plant shuts down to put the new outside configuration in service. No one is particularly happy about having to get this done. Can RPZs Be Installed inside without risk? 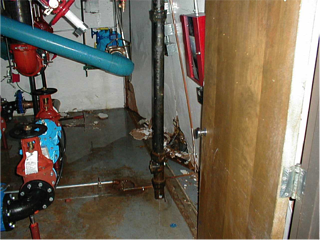 The way most engineers work around these dangers is to install a floor drain or floor sink. The RPZ in this case has one, and it may look like it's adequate. However, if you watched the video of one of these devices failing - just a small 3" version - you'll know that the drain will not carry all the water from this backflow preventer. You may wonder if only certain RPZs dump too much water for drains to handle. Nope, it's all of them that are 3" and larger and you can find flow rates for each type of valve from every manufacturer on their websites. Here is an example from Watts. The next logical step is to simply make the drain larger. Unfortunately, that is not practical in most cases. David DeBord, Vice President of Education for the American Society of Plumbing Engineers, has written an article explaining the problems with relying on drains for RPZ flooding. Watch the video below for an example of an RPZ dumping water. We get calls a few times a month about this exact situation, so we know it's pretty common. By the way, it's not even discharging at full pressure or capacity. If you are an architect or design engineer, your client, the owner is important to you. You want nothing more than your project to be a success and the owner to benefit from your good decision making. But based on this overwhelming amount of evidence, why should you take the risk of installing the RPZ inside the building? There’s nothing to gain and everything to lose. On your next project, will you stay with the status quo for the RPZ backflow device design, or will you make a decision in the best interest of your client and move it outside? We’d like to hear what you think.